Florida residents have always been able to play poker –the state has some 23 poker rooms— just with a few stipulations: The maximum bet amount was $5, and the Maximum buy-in was $100. So, maybe it’s a bit more genuine to say that Florida poker players were allowed to participate in very low-limit poker games. 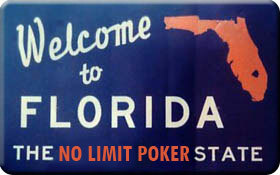 Fortunately, for Floridians all that has changed, as the limits on betting have been lifted, and No Limit poker is now available throughout the State’s legal card-rooms. Outgoing Governor Charlie Christ, who has left the Republican Party and is running for State Senator as an Independent, was one of the catalysts of the measure, which goes by the innocuous name of SB 622. As more and more states legalize poker and other forms of gambling –or expand on laws already in place—it puts more and more pressure on the federal government to take a closer look at online gambling. Furthermore, as a few states have already shown; if the federal government doesn’t do something to legalize, regulate, and tax online poker the state governments will! Just do a search of the PNB archives for California, New Jersey, Las Vegas, and even Massachusetts to see some of the proposed legislation at the state level. This entry was posted on Wednesday, June 30th, 2010 at 8:11 am and is filed under Poker News. You can follow any responses to this entry through the RSS 2.0 feed. You can leave a response, or trackback from your own site.